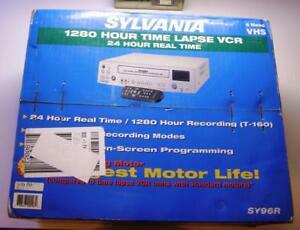 The Sylvania SY96R 1280 Hour Time Lapse VCR is the perfect complement to your security system. Capture up to 1280 hours of time lapse video or 24 hours of real time video. The Longest Life Bearing Capstan Motor provides 250% to 800% longer life than standard time lapse VCRs. The VCR comes with 14 selectable recording options, four selectable recording modes (alarm, panic, repeat and timer), and the built in rechargeable back up battery lasts up to a month. A great feature that comes with this VCR is the power loss memory feature which remembers the 35 most recent events. Buyers agree and understand all bids and buy it now purchases are FINAL SALE NOT RETURNS ALLOWED PERIOD. Buyers responsible to Read Descriptions, Terms of Sale, and ASK Questions before bidding or purchasing item. Only exception if item is lost or damage Buyer required to cooperate with Page Family Collectables and Insurance Carrier throughout claim process. NOTE:Claims may take up to 45-60 days or longer depending upon nature Claim. Page Family Collectable has no control over claim process.